Please email wecinemas@engwah.com.sg for more information. 1. 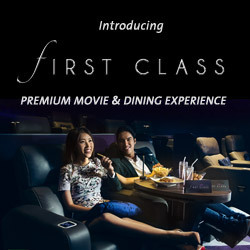 By purchasing, redeeming or attempting to redeem this Dining Gift Voucher, you accept and agree to be bound by these Terms and Conditions, and also the general WE Cinemas’ Terms and Conditions that are published in full on www.wecinemas.com.sg. 2. Dining Gift Voucher is in Singapore currency. 3. Dining Gift Voucher must be presented at the WE Cinemas box office to exchange for food and beverage items, subject to availablity and terms and conditions. 4. Any outstanding difference between the Dining Gift Voucher and the amount of the purchase must be paid in cash or a valid credit or debit card at the time of transaction. 5. Dining Gift Voucher is not exchangeable for cash and may not be used on promotional items, unless otherwise stated. Dining Gift Voucher cannot be used with other promotions, discounts, coupons or vouchers, unless otherwise stated. 6. WE Cinemas strictly does not entertain acceptance and revalidation of expired Dining Gift Vouchers. Any unused or expired Dining Gift Vouchers cannot be refunded for cash or exchanged. 7. Only original Dining Gift Voucher is accepted. Dining Gift Voucher will be subject to verification at time of presentation and we reserve the right not to accept any vouchers that have or appear to have been forged, damaged, defaced or otherwise tampered with. 8. WE Cinemas disclaims any responsibility for any Dining Gift Vouchers that have been lost, stolen, forged, damaged, defaced or otherwise tampered with. The Dining Gift Voucher holder is responsible for the Dining Gift Voucher and is liable for all transactions on the Dining Gift Voucher. 9. WE Cinemas reserve the rights to amend any of the terms and conditions without prior notice. In the event of dispute, the decision of WE Cinemas is final. Changes to the terms and conditions will be published on www.wecinemas.com.sg.